Africa’s urban population is on the rise. With nearly 200 million people between the ages of 15 and 24 living in urban areas, the business sector is unable to meet employment demands. Recent statistics show that Africa’s youth are three times more likely than adults to be unemployed, so finding sustainable opportunities for a rapidly-increasing workforce is a major concern. Kenya prioritizes agri-business opportunities and youth employment in agriculture, but there is limited evidence of successful business models that benefit youth (ages 18-35). This project sought to build the capacity of the country’s youth to develop innovative business models that increase their participation in the fisheries and poultry sectors. While many programs focus on single strategies to support youth entrepreneurs, such as the provision of capital or training, this project tested an entrepreneurship development model that combined training, business innovation services, and action research. It provided a platform for young men and women to adopt and develop new products and bring them to market. This helped to support the growth of successful enterprises and provide networking opportunities for young entrepreneurs. A nationwide call for program participants attracted 301 applicants, from which a pool of 39 were eventually selected to attend an intensive business training course. This course included instruction in business plan development, product marketing, financial management, resource mobilization, information and communication technologies, record keeping, and production and operation management. The project’s training component contributed to increased agricultural productivity by enhancing business skills. For example, a female entrepreneur who had 840 birds before the program has since trained 75 poultry farmers to serve as suppliers, one of whom now has 700 birds. The training also enabled participants to access resources and markets. 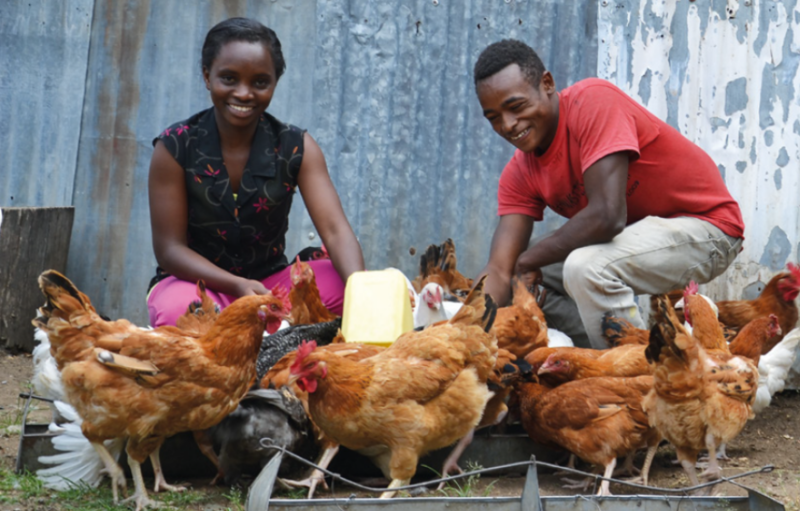 In another example, one entrepreneur received US$19,000 (CA$25,080) from a savings and credit cooperative to implement his aquaculture business plan, while yet another won a government tender to deliver 50 chickens per week for functions within the county office. After pitching their business plans to a team of industry experts, the top 20 trainees were selected to receive business counseling and mentoring support to launch their businesses. Ultimately the project achieved a 90% business launch success rate for these young entrepreneurs in the fish and poultry sectors. Sixty percent of these new ventures were launched by women. The project took several measures to ensure the participation of young women. For example, women received support at their homes in order to increase their retention rate in the program. Compared to their male counterparts, female applicants demonstrated a greater capacity to complete the entire training program. In the training stage of the program, men made up 68.4% of participants, but by the business launch stage of the program women made up 66.7% of the group. The top three performers of the final group were women, and these entrepreneurs were selected to receive further support from project partners. The research component of the project assessed different types of assistance to youth entrepreneurs to determine which approaches were most effective. Project results were presented to the African Development Bank Group, which is incorporating the lessons learned into its ABLE Youth project aimed at contributing to job creation, food security, rural income generation, and improved livelihoods for young people in both urban and rural areas. The research team has also engaged with the Kenyan Ministry of Agriculture and the National Commission for Science, Technology and Innovation (NACOSTI) to encourage them to allocate more funds for research in business and innovative models, and to provide better structures to create an enabling environment for youth ventures to thrive.